From a healthy diet depends largely on human health. The habit of eating properly should be developed from childhood, but not everyone succeeds. Many people suffer from various eating disorders that can lead to overweight and obesity. One of these bad habits is the use of harmful food before bed. Proper nutrition is built on several principles, observing which, a person can maintain the desired level of weight and consume the necessary calorie intake depending on age and lifestyle. For example, a woman aged 26-50 years, leading a sedentary lifestyle, needs to consume 1800 calories per day. A man of the same age and with the same level of physical activity needs 2400 calories per day. Proper nutrition should include a sufficient number of proteins, fats and carbohydrates. A complete rejection of one of the components while following a diet can lead to health problems. Therefore, the diet should be selected only on the advice of a specialist in accordance with the age and health of the patient. When observing the scheme of proper nutrition, it is desirable to eat 5 times a day in small portions. The most important meal should be breakfast. It is he who provides energy for a long time. Breakfast should contain complex carbohydrates, such as cereals, muesli, pasta, fruit or berries, tea or coffee. Lunch should consist of soup and second course, but not necessarily. Soup is one of the useful and nutritious dishes. Some soups have a low enough caloric content, for example, broths with vegetables and chicken. The second dish may include stewed vegetables, lean meat or fish. The composition of the dinner should also include vegetables. Carbohydrate food – pastries and confectionery in the evening is undesirable, especially at bedtime. Diet nutrition for anyone who wants to lose weight or maintain it at the desired level, must be completely ruled out fatty, sugary and salty foods. Why do people eat before going to bed? Eating food before bedtime contributes to the appearance of extra pounds. Some people would be happy to lose weight, but they are hampered by a lack of will power or stress. It is generally believed that eating at night is harmful, because at night the metabolism slows down, and the extra pounds are postponed. Often, with compulsive overeating, people do not use the most nutritious food – buns, pies, cakes, sweets. They practically do not bring benefits to the body. They are the source of unused calories. Therefore, all the dreams of losing weight fail. People eat before going to bed for several reasons. The first is the lack of food throughout the day. A person skips breakfast, because in the morning there is not enough time for him or there is no desire to eat. Also, he can skip lunch or dinner because of the high workload at work. Another reason is the “jamming” of stress. It is the nervous tension that causes compulsive overeating. Not all, but many people persistently pulls to the refrigerator late at night or at night in stressful situations. The most harmful food products that contribute to weight gain are sweets, pastries, pickles, smoked products, sausages and canned food. But there are others that you can eat at night without fear for weight. What foods are not harmful to eat at night? There are useful foods for the body that you can eat at night and not be afraid to get well. It may seem strange, but among such products, for example, there is dark chocolate. It is much more useful than milk, and, moreover, chocolate bars. It contains vitamins such as B1, B2 and E.
tea with lemon and ginger. It is no accident that ginger is a part of many diets. This is one of the most important products that help to fight excess weight or keep it at the right level. Tea perfectly quenches thirst, which is sometimes masked by hunger. In night and evening snacks there is nothing dangerous. 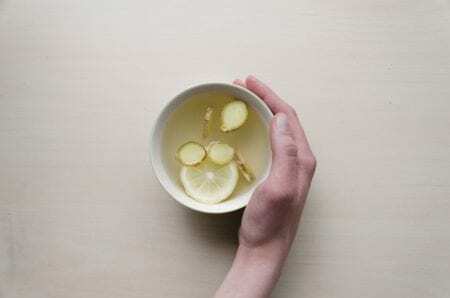 If a person will eat foods that will not have harmful consequences for weight, then the food for night snacks calms the nerves and does not affect the harmony. It is hardly worth including in the evening diet foods that excite the nervous system, such as coffee. Do not eat and those that contain simple carbohydrates, including sugar. If compulsive overeating caused by stress becomes a problem, first, it is necessary to eliminate its root cause, that is, the source of stress or to get rid of eating disorders with the help of a specialist. It is possible that the cause of overeating at night is much deeper than the feeling of hunger.